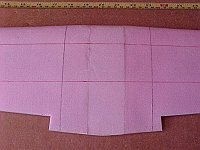 If you are a foamie modeler or aspiring foamie modeler, this article provides good information on finishing foam airplanes with Silkspan or fiberglass, and Minwax Polycrylic. 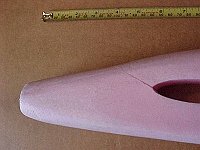 This report is about finishing foam airplanes with Silkspan or fiberglass and Minwax Polycrylic, and I hope that some of you will enjoy reading about results of my experiments. Please note that Minwax Polycrylic is NOT polyurethane! The following is how Minwax describes the product. Minwax® Polycrylic® Protective Finish is a hard, crystal clear, extra fast-drying protective finish designed with the user in mind. It is non-flammable and has very little odor. Best of all, you can clean up with water. This product resists damage from abrasion, scuffing, chipping, water, alcohol and other common household chemicals. 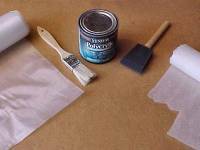 Here are the essential materials required to cover a small rigid foam airplane. The fiberglass on the left is 3/4 ounce straight weave cloth. 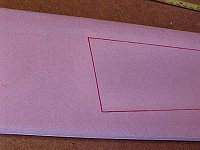 The "00" Silkspan is standard hobby shop Silkspan. Take note of the corner that has been torn off. It shows clearly the "grain" of the Silkspan. This is important to keep track of if optimal results are to be achieved. The photos above show the bottom of the completed wing. Outlined in red is the patch of 3/4 ounce fiberglass that was laminated underneath the Silkspan. The black outline shows where the Silkspan was overlapped in the center section. Here is the top of the wing. Note the translucent nature of the material system including the fiberglass. Note also the slight bowing of the ailerons in the middle photo. 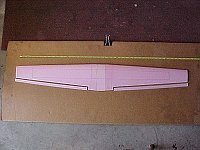 This is due to the shrinkage of the Silkspan on the hinge side of the aileron. 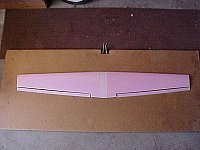 I covered the entire aileron so as to gain torsional rigidity. This torsional rigidly was achieved to a greater extent than had at first been anticipated. The ailerons are exceptionally light and stiff. Interestingly enough, the slight bowing is easily overcome with hinge tape and a fine hinge-line is produced. Basically, the bowing is not a problem. This photo above attempts to show surface finish of the wing. This is with just a light sanding of the cores and straight Minwax Polycrylic right out of the can to apply the covering. I have not sanded the wing yet. A slight scuff-sanding with some 400 grit sandpaper and it will be ready for some primer! Here I attempt to show the surface finish of the fuselage. This fuselage was shaped and sanded with nothing but 50 grit sandpaper! Where I gouged it I did use some light weight spackle, but, as this is and experimental surface preparation, I wanted to press for a worst case scenario. Of special note is I used 20% thinned Polycrylic to cover the fuselage in an attempt to save some weight. I can now state that I prefer straight Polycrylic with no thinning. In addition to being easier to handle, the resulting final finish speaks for itself. Here are different views of the fuselage. With this technique, you first cover and then cut out all of the hatches. Then you can patch and paste and lay down strips, and then re-enforcing pieces as required. After the Silkspan is applied, you can make VERY crisp hatch lines! The photos above are views of the covered empennage. I used the thinned down Polycrylic to do this. It added 3 grams of weight and did not add significantly to the strength, so I cannot recommend covering wooden surfaces with the water based Polycrylic and Silkspan. It soaks in too much to be controllable. Perhaps a sealer coat before application of the Silkspan would be better. On the next try, I think I will follow the techniques used by the R/C hand launched glider fraternity; they seem to have lightweight finishing of balsa wood down to a science. Still, it should be noted that the stock Coroplast empennage weighs in at 23.1 grams, so there is still room for weight gain to achieve a very nice finish and still come in under stock weight. 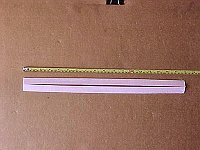 The purpose of this experiment was to determine if a structure-less foam airframe could be achieved with fiberglass and Silkspan at an equivalent or lower weight than other construction methods. 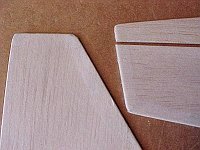 The use of Minwax's Polycrylic coating in lieu of traditional dope or white glue as a cost effective, foam compatible covering material was shown to be effective. In addition, it is actually kind of fun as there is no odor and it just washes right off your hands with water. The application method is simple and straight forward. Apply the fiberglass, brush on Polycrylic, apply the Silkspan, brush on the Polycrylic, and then let dry. It should be noted that the Polycrylic does not achieve full hardness for 2 to 3 days, so give it some time before applying flight loads. Speaking of flight loads, I took the center section core bed and used it as a support for the completed wing and did a static load test. The wing deflected 3/4", at the tips, at 107 ounces total load applied mid-span of each wing half. This is approximately 6 G's. At this point, the test was stopped and an inspection was performed. The top of the wing was starting to buckle right where the core bed ended. This was the stress riser that limited the test. If I was to change any one thing in the lay-up of this wing, it would be to apply one more layer of glass cloth to the top, center third of the wing before applying the Silkspan. Still, my opinion is that this wing, as is, will survive any and all flight loads a speed 400 could place on it. During this experiment, I was constantly trying new techniques. One of them was to compare 3/4 ounce fiberglass with 00 Silkspan, both using Polycrylic. The results were both surprising and encouraging. If you take the wing as above and subtract out the foam weight, and then take the top and bottom surface area and divide that out, you get a covering weight with fiberglass reinforcement of 87 grams per square yard. If you take the straight 3/4 ounce glass cloth and apply it with Polycrylic (no Silkspan at all) you get 50 grams per square yard. That is a whopping 42% weight reduction! And it is so much stronger that there is absolutely no comparison. This basically is saying that Minwax Polycrylic may be a safer, viable substitute for epoxy resin when fiberglassing raw polystyrene foam. Now, you still have to take into account the weight of filling the weave of the fiberglass, but Jim Ryan has already developed an excellent light weight method for doing just that. I leave it to the reader to give Minwax's Polycrylic a try. You might be surprised! There is approximately $2 worth of covering materials used on this E-plane. 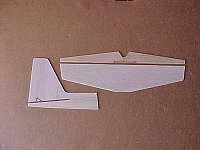 Editor's note: To see an example of a plane finished using the Polycrylic/Silkspan technique, check out the E-Zone's Lil Sporty article published August 15, 2001. I´v been using woman nylon phants or socks...i don´t know the name in english...with epoxy and the result is good and cheep. I wish I would have known about this sooner. Thanks for all the info, You'er helping make this hobby a better one for me. Has anyone tried doing the following? Repeat steps 1-3 until enough fiberglass is on the surface. For stiff gws foam, what will be stronger 3/4 oz fiberglass or silkspan? I think you concluded fiberglass, but I'm not sure. Also are you using both coverings to make it stronger? Why bother with silkspan? 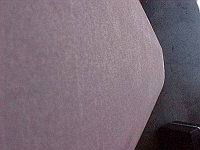 Is it a smoother finish or easier to work with then fiberglass? One question... Is waterbased wood varnish able to be used as a substitute as minwax is not available in my country.I tried using a waterproofing membrane but that didnt work, the fibers dont sand down they just fluff up. MadCroat i tried the varnish on just the plane alone and it has a relly nice finish but reacts with common spray paint to make bubbles. Along with RC modifier and Madcroat and many other modellers not resident in the USA, I am unable to purchase Minwax Polycrylic. A few years back I did some research to find out what it was made of to get a substitute, and came to the conclusion that it was indeed, a water based polyurethane, and similar to several other local Australian products. Bob's note that it was NOT a polyurethane therefore came as something of a surprise. Can Bob or anybody verify this statement? - and tell us why and how it is a more useful product for our applications. I would like to provide some more of the Minwax quote, which indicates to me that it probably is a member of the waterbased polyurethane type. I note that the title " Polycrylic" is a registered trademark - which would indicate that this is not an accepted chemical name for a type of material. If minwax make a range of similar polyurethane coating products, it would seem unlikely that the 'Polycrylic" is of a different chemical base. But anything is possible huh? Further to the above, latest research would indicate that Minwax 'Polycrylic' is a water based polyurethane/acrylic mix. Any brand water based polyurethane works, heck, I even accidentally used a water based sanding sealer once with good results.